As the first publication dedicated to the healthcare IT market, Health Management Technology delivers real-world solutions, news and product trends, including HIPAA and regulatory compliancy, electronic medical records, wireless systems, revenue management, clinical information systems, data security and storage and scheduling. Subscribers include senior C-level executives and IT managers in hospitals and healthcare organizations, integrated delivery networks, managed care organizations and health plans, physician's practices, and IPAs. Medical Laboratory Observer (MLO) publishes peer-reviewed articles, CE courses, lab management tips, regulatory updates, industry tends and new product reviews for medical lab directors and managers. MLO is a multimedia resource delivering a monthly magazine and digital edition, daily e-newsletters, product e-spotlights, a comprehensive website and the annual buyers guide, Clinical Laboratory Reference. The Triangle Tribune is a division of The Charlotte Post Publishing Company, Inc. (TCPPC). Minority owned and operated, TCPPC has served as a dominant force in educating, empowering and enlightening African-American communities since 1878. Published weekly, the Triangle Tribune is a trusted media resource with comprehensive news coverage from a "Black Perspective" that is progressive, thought provoking, community involved, culturally aware and socially engaged. 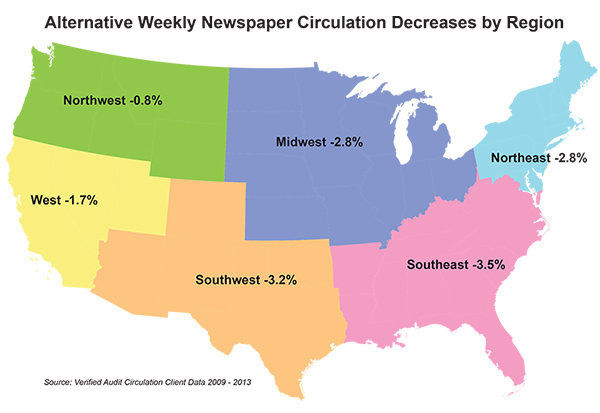 The combined qualified circulation of free alternative weekly newspapers has decreased a mere -2.4% over the last 5 years, according to analysis by Verified Audit Circulation. The study reviewed audited client circulation data for the period 2009 through 2013, the final year complete circulation data was available. Additional regional analysis found that the West and Northwest experienced the smallest decreases with -.1.7% and -0.8%, respectively. While the Northeast (-2.8%) and Southeast (-3.0%) experienced the steepest circulation declines. According to the Pew Research Center's report, Newspapers: Total Circulation Changes Over Time, during the same five-year period, daily newspaper circulation decreased by –5.4% and Sunday circulation decreased by –3.8%. The decline could have been much steeper except audit regulations were revised to include their digital non-replica editions (which can include apps) and branded editions in their total qualified circulation. Classified ads – especially personal ads – the former mainstay of alternative weeklies, have largely migrated online. According to the Craigslist factsheet, Craigslist now has 700 local sites in 70 countries. Craigslist posts 80 million new classified ads per month and are the leading classified service in any medium. Despite the challenges facing all print publications, free alternative weekly newspapers have had only small decreases in their overall qualified circulation. By including web traffic and digital editions to their current print circulation figures, the decrease may even be smaller. According to a custom survey by Nielsen with Essence, African-Americans consume more content, and engage and connect, more than other groups on all fronts, through various mainstream and niche media outlets and platforms. In a consumer marketplace cluttered with options, African-Americans choose the best-fit media outlets for news gathering and entertainment purposes, reporting above-average consumption across each platform. African-Americans watch the most television of any group, watching nearly 200 hours per month, roughly 60 more hours than the total audience. While blacks watch more live television than other groups, says the report, levels of time-shifted and video-on-demand viewing are increasing as well, furthering the notion this group of consumers is multifaceted in their approach to viewing their favorite broadcast and cable programs. African-American consumers still trust print. 52% of the black consumers Nielsen surveyed were more likely to be voracious readers of magazines, which is 30% higher than the general population. Culture and heritage are drivers of preferred reading choices for blacks. Among survey respondents, African-American-focused magazines and newspapers were important and provided information about products and deals. Fifty-nine percent of African-Americans agreed that advertisers in black newspapers, specifically, know how to connect with black audiences. Because of blacks' strong affinity for culture-rich content, general-market outlets have established niche websites that offer a space for African-American-inspired stories on digital platforms. In a recent Nielsen report, where 10,000 African-American adults were surveyed, 92% said they tune into radio each week, listening for more than 12 hours, which is 5% longer than the total audience. Peak listening hours are between 10 a.m. and 3 p.m., with 61% of the listening occurring outside of the home. Top-ranked radio formats for African-Americans with audiences that are more than 70% black are Urban Contemporary, Adult Urban Contemporary and Rhythmic Contemporary. Other influential formats include Gospel and Urban Oldies, which maintain 90% of black audiences.